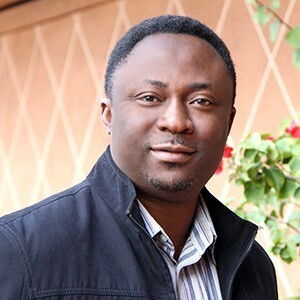 Bayo Akinfemi obtained a B.A Honors Degree in Performing Arts from the University of Ilorin and began his career as an actor/stage director in Nigeria. He worked for a few years and had gained considerable recognition before traveling to Canada to pursue his dream in filmmaking. He started as a P.A. after film school and soon joined the Director’s Guild of Canada. He then had the opportunity to work as an Assistant Director on numerous Hollywood movies including UNDERCOVER BROTHER and THE TUXEDO. Soon after, he wrote and directed his first film, a short titled EYE AND I and has since directed several others including A NOVEL ENDING, BEHIND CLOSED DOORS, MY LITTLE PACKAGE and DAYS AWAY. Bayo wrote and directed his debut feature length movie, SCOUNDRELS OF FAITH in 2008. His second feature, PAPARAZZI-EYE IN THE DARK, won Best Director honor at the 2011 NAFCA Awards. It was also an official selection at the 2012 Pan African Film Festival in Los Angeles. His latest flick, BUSTED LIFE, has earned him a Best Director nomination at the 2014 NAFCA Awards. As an actor, his Film and Television credits include BULLETPROOF MONK, SOUL FOOD, CRASH AND BURN, HEARTLAND, ELEVENTH HOUR and BLUE MURDER. He was nominated for his first GEMINI and ACTRA Best Actor Awards in 2004 for playing the lead role in CBC’s mini-series, HUMAN CARGO. His second nomination was for his haunting portrayal of a Sudanese warlord in an episode of THE BORDER in 2008.